Ever wanted to measure internet bandwidth speed? Have you ever found yourself wondering why some downloads seem to take an eternity to complete, or why your e-mail program seems to be stuck in the middle of e-mail retrieval. Is it really hanging, or maybe it’s just downloading a large e-mail attachment? A bandwidth measuring program provides the answer to these and other mysteries, and can help you to maximize your bandwidth potential. These programs lets you see how much of your full bandwidth potential is actually utilized at any given point of time, either by displaying real-time graph, numerical display, or both. It lets you actually SEE the data flowing! 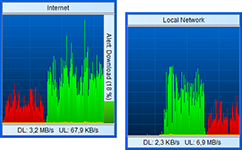 DU Meter shows you a graph of your Internet Bandwidth (Up and Down Both). It saves the bandwidth history Daily, Weekly and Monthly and A Total SUM. It aslo gives you the option to start StopWatch.